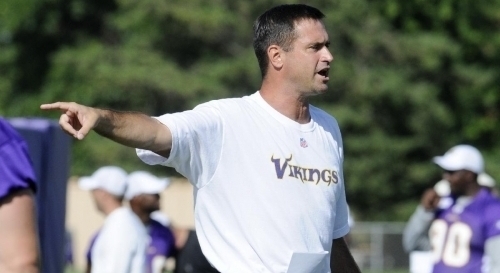 PETITION: Minnesota Vikings, Don’t Hire Mike Priefer As Head Coach. Suspend Him. Truth Wins Out has launched a petition in response to Chris Kluwe’s allegations that, during his time as a Minnesota Vikings punter, Special-Teams Coach Mike Priefer uttered anti-LGBT words so hateful that, regardless of his skill as a coach, he has no place leading a team in the NFL. We are petitioning the team owner, Zygi Wilf, and NFL Commissioner Roger Goodell to make sure he is never hired as head coach, and moreover recommending that he be suspended. Chris believes that his advocacy was a major reason he was fired, while the Vikings contend that he was let go for purely football-related reasons. Now that head coach Leslie Frazier has been fired, Priefer is said to be in contention for the job. Regardless of his coaching abilities, a man spouting that sort of hate has no place leading a diverse team representing a state that has affirmed the dignity of its gay and lesbian citizens with full marriage equality. We petition Vikings owner Zygi Wilf, a marriage equality supporter, and NFL Commissioner Roger Goodell to protect the Vikings’ good name by refusing to consider Mike Priefer for the position of head coach, and further request that he be suspended from his duties. CLICK HERE TO SIGN, and then share it with as many people as you are able. Truth Wins Out (TWO) is a non-profit organization that works to demolish the very foundation of anti-gay prejudice. Our philosophy is simple: We attack the underpinnings of homophobia by debunking harmful lies, discrediting hateful myths, and countering anti-gay organizations. By chipping away at the underlying ignorance that fuels anti-LGBT attitudes, we can ultimately win our fight for fairness and achieve full equality for gay, lesbian, bisexual, and transgender people worldwide.